Such steles, sculpted in minimal relief and most often separated by pilasters, decorated the bases of Buddhist sanctuaries and relic-tumuli (stupas). On the stele discussed here, rich architectural decoration surrounds a trefoiled niche. There are wide cut-away pillars embellished with garlands. As with real architecture, their base is protected by a pot, isolating them from both wood-eating insects and humidity from the ground. 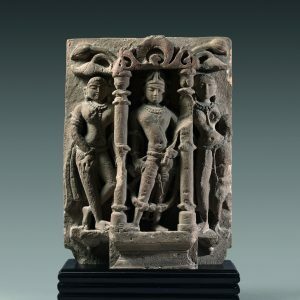 It is all reminiscent of a fragment of base from the Patna District of Bihar, dating from the 9th century and conserved at the Los Angeles County Museum (Pal, 1988, p. 71, No. 71, inv. 79.188). The capitals support a tora-type carved arch whose extremities have the protome shape of a makara monster, half crocodile, half elephant. These fantasy creatures are spitting beaded garlands. Above are the various tiers of a roof with prasada-style superposed terraces. The main niche and the three small niches on the top course enclose Buddhas. The large, crowned one is making the teaching gesture, spinning the Wheel of Law (dharmachakra mudra). 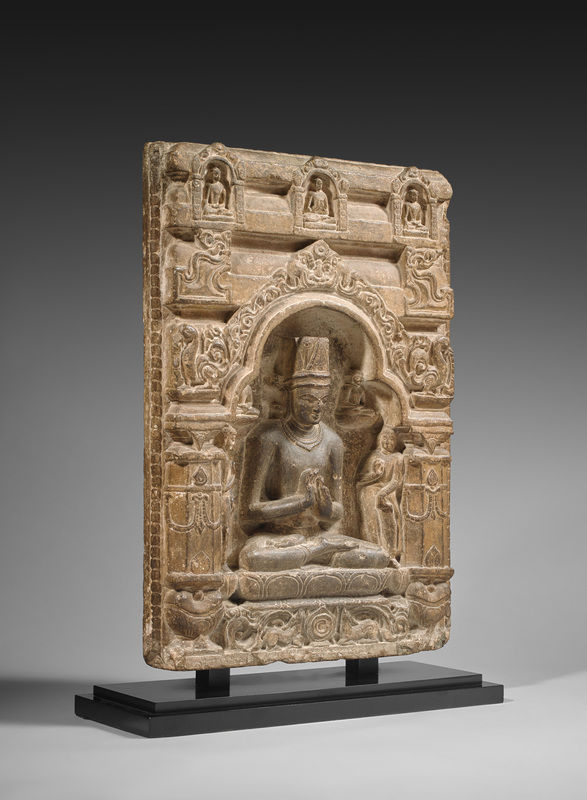 The presence of the Jinas of esoteric Buddhism in the upper part and in the polylobes of the main niche tends to identify the main deity with Vairocana, the Jina of the Center. And it is under this designation that the work was classified during its recent sale in New York (Christie’s, No. 4049). This designation raises two problems. Vairocana is represented twice, once in the main niche but also in the small central niche of the top roof. To eliminate this redundancy, it could be supposed that the main deity is Mahavairocana, superior to Vairocana. But this only raises another problem. 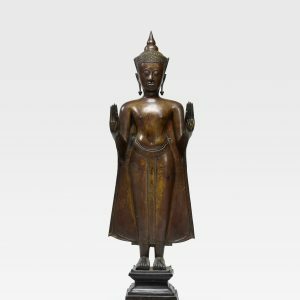 In the Pali canons of the 9th-10th century, Mahavairocana always has four heads, not just one. 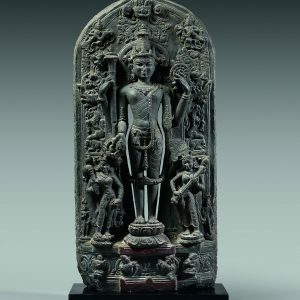 From their Buddhist heavens, these divinities at the top of the religious pantheon preach to the buddhas and bodhisattvas the most complex texts of Vajrayana scripture. Here, in the lower part of the relief, is a small wheel framed by two deer, which makes it possible to identify the scene beyond question: the first sermon of Buddha Shakyamuni in the Sarnath gazelle park near Varanasi. 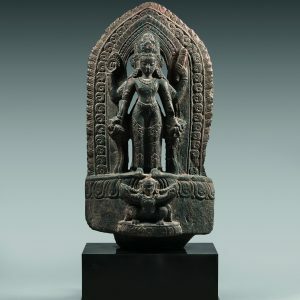 While representations of Shakyamuni crowned as the universal ruler (chakravartin) are well-known in Southeast Asia, even in a theravada context, the origin of this iconography must be traced back to India. The historic Buddha is shown with his crown during the earth witness episode preceding his Awakening, surrounded by the evocation of other notable events from his life, on Pala steles such as the one in the Indian Museum of Kolkata (Loth, 1994, p. 151, Fig. 224) or another in the Museum of Fine Arts in Boston (Susan and John Huntington, 1990, No. 31, p. 158, inv. 24.153). The Musée National des Arts Asiatiques – Guimet (Parlier-Renault, 2010, p. 113, inv. MG 5835) has a relief with many affinities to ours, so much so that they might both come from the same artist’s studio. It is striking to see the same profile of the outline of the cornices, the roofs and the other sculpted parts in general. The only differences: the makaras are replaced by heavenly cranes (amsa), the Kirtimukha mask is larger and the lower section of the relief is decorated with large floral motifs. The Guimet relief is from Bihar, perhaps from Bodh Gaya. 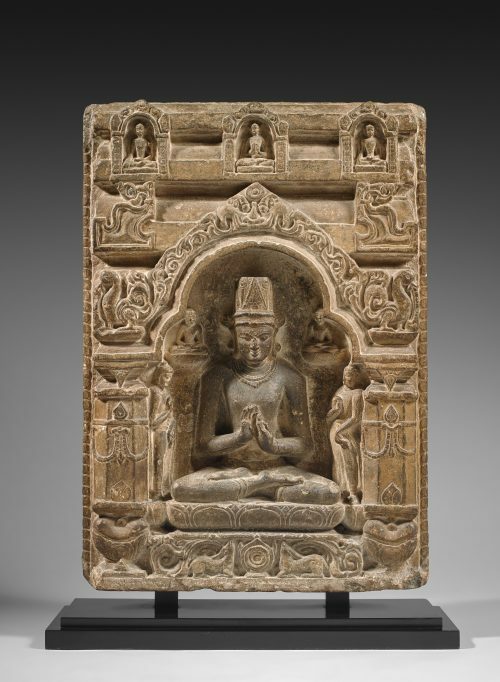 The dimensions are similar: 52.1 cm tall for the relief in the Musée Guimet and 51.4 cm for the relief discussed here. Provenance: Private collection, Brussels, acquired in 1980. Exhibited: Sculptures des Indes, Société Générale de Banque, Brussels, 8 Decembre 1978 – 31 January 1979. Bibliography: A. Neven, Sculptures des Indes, 1978, p.22, cat. no.173.